Beautifully white-etched Black hook (Water buffalo horn, back is flat) is 2" long x 1-1/4" wide, on a 26" natural braided cotton cord necklace with bone bead adjustable sliding knot to any length you need. 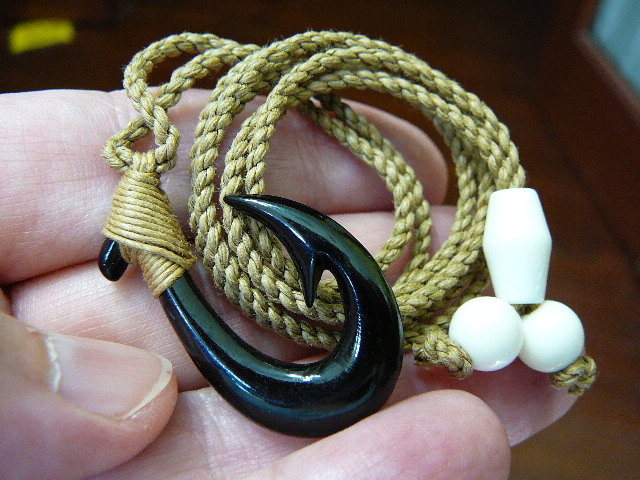 Beautifully white-etched Black hook, pointed on bottom (Water buffalo horn, back is flat) is 2-1/4" long x 7/8" wide, on a 26" natural braided cotton cord necklace with bone bead adjustable sliding knot to any length you need. Hook and necklace are woven together, not detachable. 2-1/2" long x 1-1/4" wide, natural cow bone, specially wrapped on a 28" natural braided cotton cord, adjustable white bone beads to any length you need. Hook and necklace are woven together, not detachable. Hook itself is 2" long x 1" wide, natural cow bone, specially wrapped on a 28" braided black cotton cord, adjustable white bone beads to any length you need. Hook and necklace are woven together, not detachable. Hook itself is 1-7/8" long (due to long hook on bottom) x 1" wide, natural cow bone, specially wrapped on a 28" natural braided cotton cord, adjustable white bone beads to any length you need. Hook and necklace are woven together, not detachable. Hook itself is 1-7/8" long x 1-1/4" wide, natural cow bone, deep fined hook with tail on end of hook, extra fancy; specially wrapped, on a 28" natural braided cotton cord, adjustable white bone beads to any length you need. Hook and necklace are woven together, not detachable. Hook itself is 1-11/16" long x 1" wide, natural cow bone, specially wrapped on a 28" natural braided cotton cord, adjustable white bone beads to any length you need. Hook and necklace are woven together, not detachable. Petite, hook itself is 1-1/2" long x 7/8" wide, natural cow bone, specially wrapped, on a 28" BLACK braided cotton cord, adjustable white bone beads to any length you need. Hook and necklace are woven together, not detachable. with mother-of-pearl iridescent shell inlay; flat on back, 2-1/2" long x 1-1/8" wide; braided double strand waxed natural cording is a sliding knot necklace from 28" extended length to as small as you need. 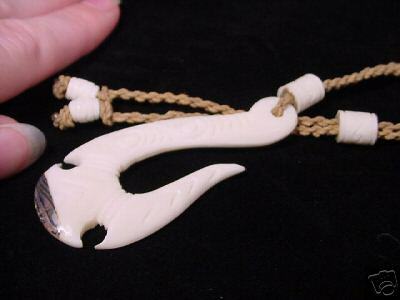 Manaia fish hook necklace (swan shape), pendant is carved of cow bone, 1-7/8” long x 15/16” wide, black braided waxed cord knotted through loop in pendant; loop + bone bead closure; full necklace is 22” long. 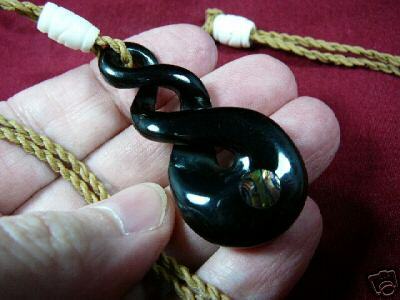 The manaia is known as a spiritual guardian, and carrier of supernatural powers. Traditionally depicted as a bird like figure with the head of a bird, body of a man, and the tail of a fish; acting as a provider and protector over Sky, Earth, and Sea. Likened to a bird sitting on your shoulder, looking after one's spirit, and guiding your spirit where it is supposed to go when your time comes. #IBP-07 Graceful & smooth, this infinity pendant is 2" long, rounded on the other side too, inlaid with paua shell, on a 26" natural braided waxed double strand cord with sliding knot. #IBP-07A Same as above, but in BLACK cow horn (3 available) $43 ea.